I used my 500, and later 3000, to connect to The Cellar, a Philadelphia BBS that had a UUCP feed. Alt.binaries at 14.4! (But for big downloads I took a stack of -DOS formatted floppies to the college computer lab to use gopher and archie.) And NCSA Mosaic did run on the 3000. Dear lord that brought back so many memories! I too had the box of floppies. Gopher was where I first found ROOT, good times. I was poking around a collage system while the “lab kid” was watching over the 20+ machines that were vacant, save for the loan few. Then he gets up comes over to me and says “I hate it when people do that would you please stop.” my response was something like “It’s ok, I know what I am doing”, his response was classic “thats what I am afraid of”. I stopped and left thinking nothing of it. Except, if you had access from home, it was dial-up. The software ran at the computer you dialed up, you had either terminal or a computer running a terminal emulator. I’m not sure when slip and ppp came along, but they came after the Web, and about concurrent or after ISPs came along to give access to all. So just about any computer could get online, you’d land in either a Unix shell or something more limited, and then launch a mailreader or newsreader at the place you dialed into. The first web browser could be used this way, it wasn’t graphic, and to this day there are text only browsers like lynx and links that can be used remotely. There is overlap since the average user didn’t directly connect to the internet, but then it was promoted as a good thing by “freenets” since any old computer could be used as long as it could run a terminal emulator. I suppose it seems different now, since by the time the masses arrived they were generally with ppp connections and running a browser etc on their own computer. But when I got full internet access in 1996, I was running a Mac Plus, and a terminal emulator, and mostly ran that till 2001 when I started running Linux, and shifted things to my computer. I still have shell access at an ISP, though no dial-up. So an Amiga 500 could be used on the internet. This scheme of course is the same except it moves the shell to your home, at the end of the pipe, while your Amiga 500 is just a terminal, with a short cable to the “server”. The average computer nowadays is way better than my ISP’s server in 1996. Lots of people have used this sort of thing to get 8bit computers online now, shell access not being very common for a long time. This pretty much says what I came here to say. From 1989 to 2002, my Amiga 2000 was online every night, via a series of increasingly fast, increasingly tiny modems. AMosaic wasn’t a great browser, but it did a fine job from 1996 onwards to about 2000. This, it just works. Then using ami tcp beta3.0 (no nagware), ip is available as a native thing to everything that wants to connect via it, so browser, ftp, uucp, wget etc. There’s cases on thingiverse to house the plipbox too. For 5v I ran it off a 5v source on my psu and I desoldered my parport and mounted the lot in the case with the rj45 mounted on the back for ethernet (I have a 2000). I bought the polin self assembly kit by accident instead of the finished board, and even that was easy and I used a uno as the isp to program it. There is/was a version of PLIP that works with the 4 bit Laplink cable, that also works with 9x and XP internet connection sharing. 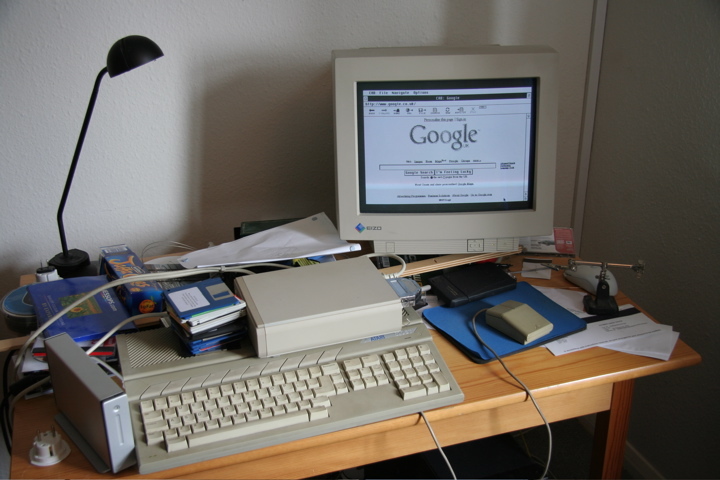 I used this setup with an A1200 and a 486 running windows 95 in the mid-late 90s. The 486 was online with first a 14.4 internal, then a 28.8 external, then a 56k internal. I tried the Amiga directly on the 28.8 external, but due to the serial ports topping out at 38,400 I think it was, the throughput was limited to a bare 3 kB a sec, compression did nothing. Whereas on the PC, with a 16550 uart, I got more like 3.5kB on binaries and up to 12kB on text and somewhere in the middle for compressible images. Anyway, with the PLIP setup I could achieve this on the Amiga also, because the transfer speed on was hundreds of kilobits per second. For some limited uses, like null modem file Xfer with only terminal running you could get 115kb out of an A1200 serial port, but for more CPU intensive tasks, like running TCP and a browser you bombed down to the lower speed. Though wierdly I think I could ICS at 56k on a null modem where it would only run a modem at 38k. Anyway, if you get a real need for speed, you can wire an 8 bit PLIP cable and find the linux device driver for it, and get around 2 megabit/sec that way. However, I was happier with the 4 bit one, because for most tasks then it was fast enough, and had DOS/Windows/Linux compatibility where the 8 bit one only did AmigaLinux or Amigaamiga. Oh yah, and to use the 8 bit, you needed an ECP capable bi directional port, whereas the 4 bit one worked with any…. and that all had to be set up to work properly on PC side, so it wasn’t very plug and play. That guide will not work using the Amiga most people had, an Amiga500 with either kickstart 1.2 or 1.3 – I know – I wrote the guide because I was pulling out my hair because all guides to getting the Amiga online did that… Which not only require a true commitment to wanting it given the complexity of the guide, but utterly forget the hardware these machines run on… It won’t work unless you have at least a 2.0 rom. That’s a lot of steps for someone to follow, even buying actual hardware… and if they buy that hardware they are going to be very disappointed when they find it does not work. Big differences between the 1.3 rom and 2.0 – The TCP/IP stacks are a no go, AMosaic? Not a chance without upgrading that machine. But I’m trying to say you don’t need to upgrade the machine, because AMosaic is going to be an atrocious experience today anyway, while the bulletin board systems are immense fun if you give them a try. Out of curiosity, were you using CAB for a browser? Those were the days, getting your ST to talk over PPP (seeing as TOS knew nothing about TCP:IP stacks or anything that remotely let you connect over the internet even back then.) And the fun waiting about 2 minutes for your ST to render a simple .JPG or .GIF image. Hopefully the page you loaded didn’t have more than 1 image on it. I know someone who did PPP real internet on an amiga too, was a 1200 though I think. Many, many people used PPP on Amigas, myself included. During the late 90’s I was online through a freenet and yes, it was a text only terminal emulator that even an 8-bit machine could manage. “Being online” doesn’t mean much in that sense, especially if you’re running the stack on another more powerful computer. What I would consider a lot more impressive would be for the A500 to dial up through a legacy standalone Hayes modem, into a standard modern dialup account, and do some email or display the Hackaday Classic page. This would show legacy hardware without modern help dealing with modern data. My Amiga 1500 was how I first used the internet back in 1996, then an Amiga 1200, for many years, then onto PCs because sadly the Amiga just couldn’t keep up with the power/price performance. Originally used AmiTCP but then went on to MiamiDx because it has better NAT capability to get more than one machine online at the same time. My favourite browser was IBrowse, though did sometimes use Voyager & AWeb. One of the biggest things I missed when moving onto PCs was ARexx, most programs had an ARexx port so could be easily controlled & read information from other programs or your own homebrew scripts that could be extremely powerful for things like batch processing. My Demon Internet email address died a few months ago, I had that almost 20 years, killed because Vodafone are a bunch of greedy arseholes. Think I mostly used AWeb on my A1200. Not sure if I’m imagining it, but seem to remember a version of links/lynx that was adapted to use AmigaGuide type hypertext, so it was a text browser that “looked nice” due to using native amiga APIs, I seem to recall browsing with that was fairly pleasant, when you didn’t need images. I came here to say roughly the same – AWeb and IBrowse (I Browse, eyebrows, geddit?). I was online with the fastest modem money could buy (56k baby! ), PPP to my ISP, amitcp, iBrowse/AWeb. As good as any PC browsers at the time. The modem was also a voicemodem, with software that would answer calls and do voicemail – functionality only otherwise available to the biggest corporations at the time. I love that. Quick and fairly cheap. I bet that works with the Pi Zero too, making it even cheaper. The kind of guides you link to (sadly the majority of guides) need an asterisk. AmiTCP will not work unless you have at least a kickstart rom of 2.0 or higher. I know this, I’ve been pulling out my hair because of articles like this. This is why I titled the guide getting the Amiga500 online, because most guides either focus on the 1200, or in the rare examples of a 500, all of them are using kickstart 2.0 – That’s disingenuous. It was following these types of guides that made me feel I received no help from anyone. This works, and, more importantly, it should be free for most people I imagine. I don’t care how cheap a Pi is I would be pretty upset if I followed that guide, bought that little computer, only to find out it didn’t work with my Amiga…and, the fact is the overwhelming majority of 500 users will have 1.2 or 1.3 as their ROM. AmiTCP is not an option, look closely at one screenshot in that guide, that’s at least 2.0 all the way while mine is working on the kickstart the machine came with. While that may be a solution for people with at least a 2.0 rom, I’m fairly certain my guide will get people of all roms online and having fun via the bulletin board systems. Truly is not much fun in browsing the World Wide Web with something like that, which I don’t believe can get out on a BBS. Dial up at 300 baud (yes), then later at 1200 on my A1000…oh the utter joy of not having to walk to “the computer center” at night in the dead of winter to run my homework!!! Late ’91 through ’92 I would dial into a freenet with my 500 and a 1200 baud modem. I think it was gopher that was used then to ‘browse’. I also remember using an ftpmail service where you e-mailed your ftp script and the service would then ftp the file you wanted, uuencode it and e-mail it back in small chunks that were downloadable over slow speeds. Chat rooms were fun then as wannabe hackers would learn how to send the ctrl-alt-del codes and kick people off (except for me since they would have had to end ctrl-amiga-amiga to reset me). Looks like this guy is basically running a mini-bbs. I have a couple old cisco routers from back when I was doing their certifications and I would configure the AUX to AUX connection to have my redundant path when studying routing protocols so as soon as I get my Amiga going again I figured I’d null modem into the AUX port and then route it out the ethernet port. Sadly I sold my A500 around ’93 or ’94 and went PC but always regretted it. I did finally ween off of windows and on to Linux around 2002 or 2003 though when XP was a flop. I finally found an old non-working 2000 local so once I get some time I’ll get it going again. I had a local coax-based ethernet network between two Amiga 2000s, in around 1992-1993. I got it on the internet via modem/PPP around 1994. It wasn’t exactly easy (not much info about it at the time), but it wasn’t rocket science. My first foray into the BBS world was a with an Amiga 500 and a Zoom Telephonics 2400 modem, a more stylish modem was never made – http://imgur.com/pgUkhKg – I wish I’d kept it now, just for nostalgia. Anyway, many happy nights were spent on text BBS over the following few years, slowly upping the ante from 2400 to eventually 56k. Just before the web became affordable there was a brief foray into “graphical” BBS systems, RIP and I think Skyline for the Amiga, but there were only maybe 2 or 3 such systems around here. By this time I’d moved through a few Amiga systems, and had at least 2 or 3 on the go, at least 2 were networked via a null-modem connection running under the floor from one end of the house to the other, I forget exactly what I did with that but I think it was file-sharing (very slowly). Then along came “cheap” access to the internet for $5 an hour around here, via a SLIP connection, using AmiTCP I think, BBS (and the various fido networks) struggled on for maybe 12 months after that rapidly giving way to the web and Usenet (in a time when your ISP always ran an NNTP server). The Amiga 500 has a PCMCIA slot, so you could as well just plug in a ~20€ WPA2-enabled WiFi card (AmiBay is your friend) and connect to your home router. There are cards that do the encryption in hardware, so your A500 should be free to do other things… I do this, albeit with an A1200 and a 030 turbo card and it works fine. It’s not the 500 that has PCMCIA, but the 600 and 1200. The 500 has a Zorro slot as a card edge connector. So sadly not in this case. Yah, no PCMCIA on the 500…. in theory though, take some of the new SD IO on floppy port stuffs and make SD card wifi work. Last I looked into it on the A1200, it supported prism based cards wireless B and WEP…. unless you wanted to run some ndiswrapper type lashup and soak up all your chip RAM. But that was a while back. Mind you I narrowly define what works as what works on classic AmigaOS, not anything after 3.5. Also I think 3C809??? (Exact memory of numbers is bad today) wired cards were well supported. I run Classic WB 3.1 here. The WiFi card uses the latest prism2 driver and runs with proper WPA2, but yes, it is a 802.11 b/g (2.4 GHz) card. MiamiDX is used for the connection. P.s. Geek bit. That is an early A500 (although that one could well have been upgraded). The early were shipped with a red power light, the 1.3 rom ones (with the fat Angus) shipped with a green light. All were easy to upgrade with a rom swap. In regards to the Fat Angus… Living in Sweden I imported my Amiga 500 from Germany, since it was quite a bit cheaper at the time, and got a Fat Angus with a red power light. 1.3 rom and the 512KB chipmem. Writer of the guide here: I like your attention to detail with the red LED comment. While true in most cases, in mine you would be mistaken. My machine was originally OCS with a 1.2 ROM, bought brand spanking new in 1987 by my father. However, due to a want for switching between NTSC/PAL graphics modes I bought another Amiga with ECS and a 1.3 ROM. But I couldn’t stand the change in the LED lights… I switched out the motherboard in my purchased Amiga and placed it in my original case, keeping my keyboard. It was enough to no longer be using a good chunk of my original machines innards, the lights I could not handle because that was something I saw every single time I used the Amiga. So I actually have one of the last 500 motherboards with a 1.3 ROM, but kept my keyboard because I wanted the red LED for power and green for drive. The little time I used the other keyboard it utterly messed with my senses. Anyone from France/Italy remembers the Minitel/Videotel Amiga client that emulated those weird all-in-one terminals bug for bug to get around the whole “you can only use our terminals to connect” thing? Because you kinda asked for it…. here’s a video of an Amiga 500 playing a YouTube Video. Meanwhile, I had my Amiga 500 Online in the 90’s. I had a Bodega Bay expansion chassis with a Commodore Ethernet card in it. ( along with a few other things). RAM expansion, 040 accelerator, and AmiTCP and I was on the Internet constantly. Meanwhile, I’m thinking that there’s an opportunity here to use an ESP8266 to make an Amiga serial to WiFi adapter. A simple version of this has already been made for the C=64. I made one. But it’s basically a dumb serial to WiFi converter. I think you could go further with the Amiga. Great article. Brings back a lot of memories I forgot about getting onto some BBS in my area using my A500 in 1992 and 1993. Damn I miss my Commodore Amiga. I need to get another one. I setup FS-UAE and play around in it, been remembering and finding some of the software I had back then. Picked up a 2000 a few months ago, replaced the leaked battery and the cpu socket so far but still need to troubleshoot some more. Back when I was in High School (circa 1990), I upgraded from a C64 w/4 1541 Floppies (,8,9,10 & ,11), 1200 Baud Volksmodem (I ran a BBS with ST/R Term.) and a C2N tape drive (used for digitizing audio from an old Compute’s Gazette program.) My new computer was an Amiga 2000 with 80286 Bridgeboard (5.25″ floppy for PC side and two 3.5″ 880K AMIGA drives.) The 2000’s had some ISA bus slots which made it easy to get an Ethernet card or SCSI card in there to “up the ante” against the other tech guys in school. The first time I was “on-line” was with Genie and dial-up on a 56K external modem. The world was an open book then. I could do anything (although limited by time every month) on that system. When Broadband home networking came about, I had PC’s with Ethernet cards, and my trusty Amiga…using the Bridgeboard…and an old Etherlink card running on the PC side (with DOS drivers). It was fun to see what it could do. Alas…the machine died 2 years ago…16MB of RAM, 1MB Fat Agnes, WB 2.1, 52MB SCSI HD, and a Syquest 80MB SCSI removable. I have all the parts and plan to “reconstruct” my Frankenputer. There was the time where it could run AMIGA, MAC and PC…those were the days. Now that the Vampire II 500+ is hitting the streets and can be installed in the A2000 with a simple socket adapter, this is the time to revive the old girl. She’ll run like never before too. But I knew as someone who has been tinkering with this on and off for years something they shall never understand; For the people who have never been involved in that scene it is nearly impossible to grab a couple programs and get it working.